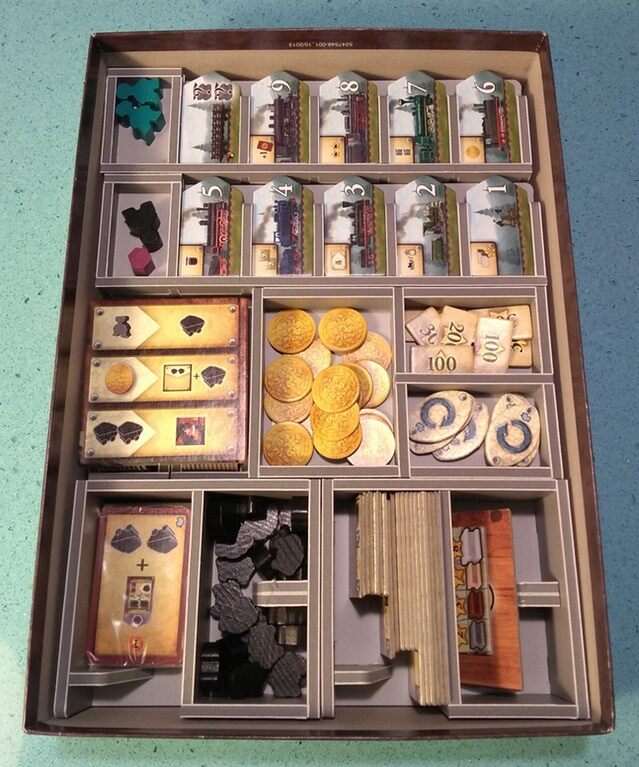 Below are images of the demonstration insert for FS-RUS insert compatible with Russian Railroads This insert includes space for the German Railroad expansion, and the 2014 Mini-Expansion. This is the first insert we are bringing images of to you that uses the new sheets of quality card and mat laminate. So i hope this update of interest to everybody not just those interested in the FS-RUS product itself. This is still a demonstration piece, so it is possible there will be some very minor changes in the final production version. With the boards and rules removed from the on top, you can see the top layer of insert trays underneath. At the top of the image you can see two long trays for storing the locomotives. These trays are made so that the locomotives can be stored in numerical order, and taken straight from the box and placed next to the board when you want to play. Below these on the left is the coal board on top of the engineer tiles. 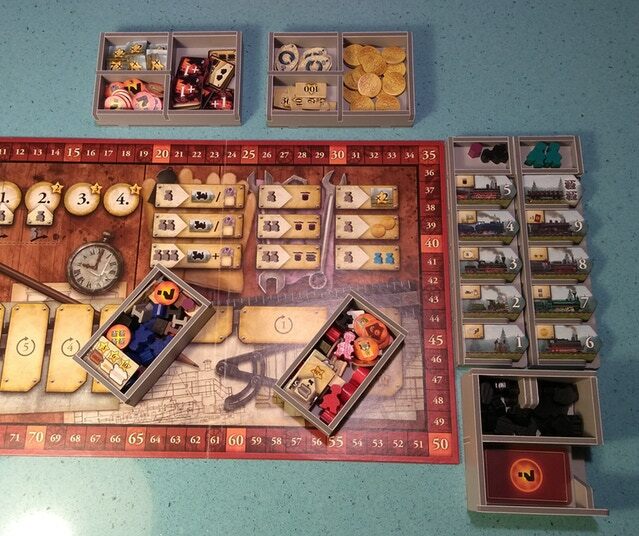 On the left in the middle is a tray for the rouble coins, the point tokens and the income markers. At the bottom are trays for the cards (sleeved or unsleeved), the coal wagons, the railroad extensions, and the other tiles. With the top trays removed you can see underneath the remaining trays. At the top are four separate trays for the player pieces. In the middle you can see the engineer tiles on the left. Ont he right is a second token tray for the doubler tokens, the foundries, and the ? tokens. 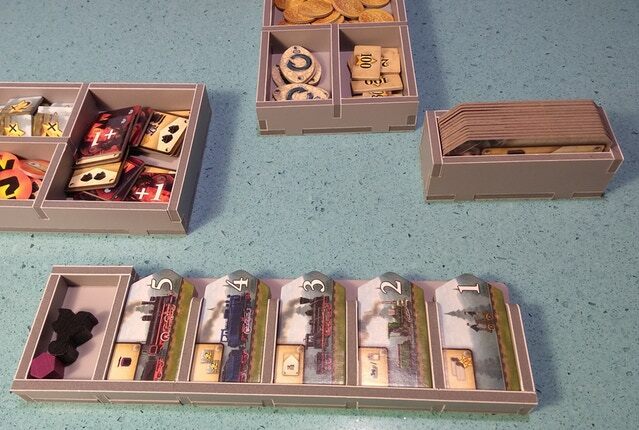 Many of the trays can be used in game to speed up setup and game play. 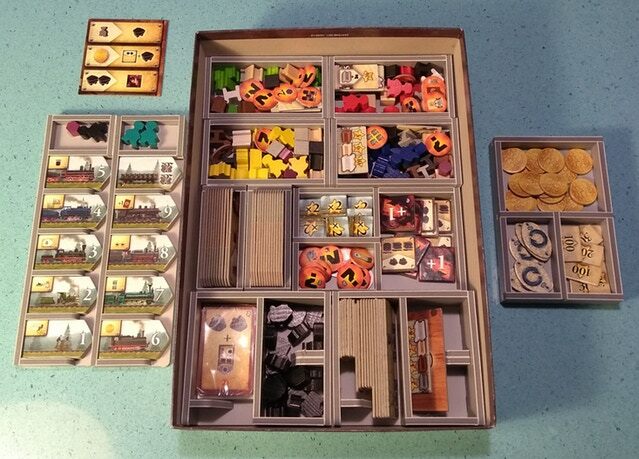 Each player takes his own player pieces tray and uses it to store all the pieces not yet in play during the game. The locomotive trays fit right next to the board, sorting all the engines by number. The other trays keep all the tokens tidy and close to hand. Here you can see a close-up of the trays made from the new material. We are very pleased with it. It bonds very well to the glue, and gives a very clean, quality finish to the trays. We hope you like it too. Will this also work with the expansion American Railroads? @Rob - we have not tested this as we don't have a copy of American Railroads (shame!). The insert is designed for both Russian Railroads and German Railroads to be stored in the original Russian Railroads box. From what i have seen of American Railroads the components are the same size as the other games, so it should fit fine in the insert in the original game box replacing the German Railroads expansion. However, as i said we have not tested this yet.